I've been hearing this all over Mpls this week. It was a UND HOME GAME. UND was the host and booked the arena, set up the ice, organized the activities, ran the whole show, sold the tickets, took the financial risk. It was not a mutually shared game in any way in that respect. Kawaguchi will take a step this year. i think his development will mimic the steady rise like we saw from Mr. Cagguila. I like Mankato coming back to the Ralph. anybody have a picture of the guy holding the Middlestadt pull-up behind the net in warmups before Friday gopher game? I think Reiger is going to be pretty good. 1. again, he's not a university employee so his opinions are his. you want him to tow the company line by UND 2. You handle the situations exactly the opposite from what happened. Get way out in front of it, inform those affected well in advance of any possible leak. This is a PR nightmare that is on a national level. 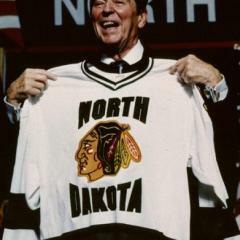 UND looks like a joke from this, baseball, and the nickname. The reputation of the university is damaged and handling things like they did today shows what a joke they are. also, how do the small schools like UMD, Bemidji, etc.. have women's hockey and UND doesn't? If you want to be big time, you find a way to keep things like womens hockey. 1. who cares what account he uses, he's not a UND employee so you're saying the Herald cannot criticize UND? 2. his criticism is mainly how the situations were being handled by USA Hockey and UND. Both handled them in a bush league manner which is indefensible.